Home > Common > Digital health and care – the future is now! 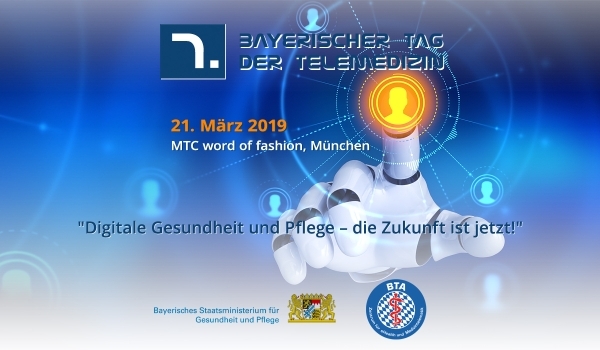 Views on the future of digital health and care will be debated by experts on the 21st March of 2019 in Munich, at the biggest medical congress in Bavaria. The MIRO Innovation Lab and VITA – Virtual Therapy Arm, both research projects of the Institute of Robotics and Mechatronics of the German Aerospace Center (DLR), are exhibiting their current developments in the fields of medical robotics and prosthetics. While the scientists of VITA refer to their works on a therapy and training system in virtual reality, the MIRO Innovation Lab presents the MIRO robot arm, which was developed specifically for the use in the operating room. Thereto Julian Klodmann of the MIRO Team gives a talk on site about “Robotic assistance systems for the treatment, diagnosis and care of patients”. The congress offers an opportunity to exchange ideas on exciting topics concerning medical technology and robotics, as well as discuss health policy issues and clarify gaps with technical experts. Co-organiser is the Bavarian State Ministry for Health and Care with Mrs. Melanie Huml as the congress’ patroness.